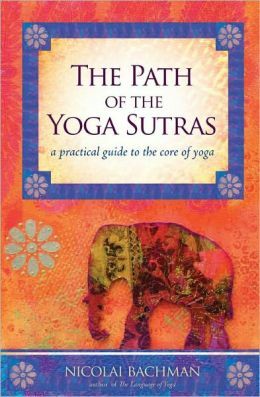 In The Path of the Yoga Sutras, author Nicolai Bachman takes a look at Patanjali’s compilation of the yoga sutras from a user friendly point of view. Clearly written and discussed in a manner that even I, a newbie in regards to Yogic scripture, had no problems understanding. These beautifully written sutras easily fit into one’s daily philosophical routine. In fact, the sutras are divided in such a way that the reader could turn this book into something of a perpetual calendar. The book is divided into five parts, the first being the Key Principles, the second, Understanding Suffering, the third, Outer Behavior, the forth, Personal Practices, and the fifth, Inner Development. The book naturally focuses on Hindu philosophy, but can be adapted easily to Buddhist or any other practice, for that matter. Sanskrit words are found in the book, which is to be expected, but don’t let that deter you. Bachman does a wonderful job of explaining each word clearly and precisely so that anyone can understand the meanings. The chapters are tiny-only a couple of pages or so- and can be easily read before each meditation practice or yoga session. At the end of each chapter, there are exercises and questions the student can use to journal her way through the text. The Path of the Yogic Sutras isn’t just another fly by night feel good philosophy book. Each page is filled with practical easy to follow advice that will not only enhance your yogic practice, can be applied to daily life as well.